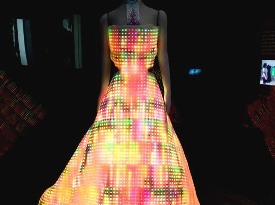 Normally, I don’t care about fashion, but after I saw this GalaxyDress, I’m starting to see a possible career in LED clothing. The Galaxy Dress is toted as “the biggest LED dress in the world”, and it features 24,000 LED lights and 4,000 Swarovski crystals. I believe that it is powered by iPod batteries, and the energy to power it is equal to about 2 light bulbs. It’s nice that it does eat up that much power. There is an awesome video of it after the jump if you want to see this Lite Brite wear. The Galaxy Dress was created by CuteCircuit, a design firm based in the United Kingdom. Designers Francesca Rosella and Ryan Genz say that the dress has never been worn by an actual person, just mannequins. Of course, I cannot really see an occasion where such a dress would be worn, unless you are filming some sort of futuristic Cinderella movie or something. The only thing I have to ask is what would happen if the dress got wet? Man, there’s a nightmare for you. Not only would you be getting electrocuted, but people would have to strip you naked to save your life. The Galaxy Dress is currently (bad pun detected) on display at the Chicago Museum of Science and industry as part of the Fast Forward: Inventing the Future exhibit.